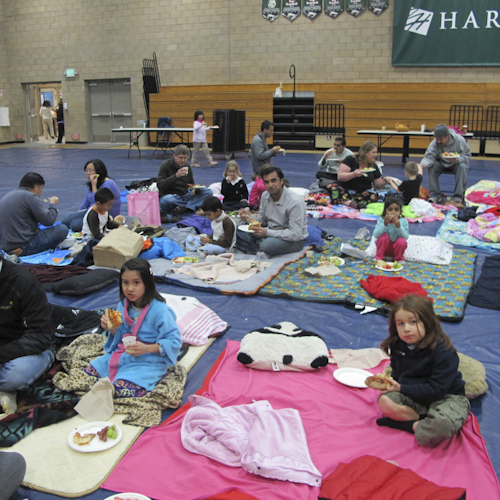 A cold Friday night in early January did not keep grade 1 students and their families from attending a movie night held at the lower school. Warmed by the good feelings of shared camaraderie, they gathered at the gym for the special event which had been organized by grade level coordinators. Some 74 people attended the evening, where they watched the third “Toy Story” movie. Wearing pajamas, the children sat on blankets munching pizza, salad, fruit and, of course, popcorn, while their parents met and chatted with one another. After the movie was over, the fun continued with students running around enjoying time with friends. “The purpose of all our after-school gatherings is to promote community,” said Tere Aceves, who Harker’s lower school volunteer director.